Here at London Social 101 we’re huge fans of Bella Italia, who is currently celebrating La Notte Rosa in London. 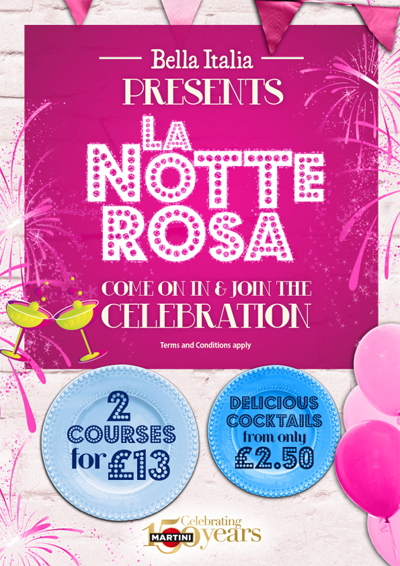 La Notte Rosa is an Italian festival that has been taking place from 18th June – 21st July, so you gotta get in quick to avoid disapointment! It is a celebration of ‘in the pink’ and is celebrated on Italian beaches and squares that are flooded with the vibrant colour. Bella Italia has partnered up with Martini to bring this exciting festival to the UK. It has created a special menu with brilliant Italian food and the perfect Martini cocktails.